One Lexington is uniquely situated, right on the edge of Central Avenue with incredible views. 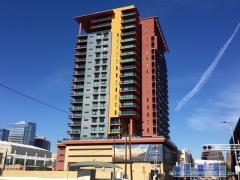 It is a monument to visionary urban design, and a landmark of the new Midtown Phoenix. The building’s concrete-and-steel construction has many advantages over other Midtown condos. It allows for easier cooling in the summer, and more efficient heating in the winter months. Most importantly, over the long term it will last longer, stand stronger, and, typically, hold its value a lot better than a wood-frame building can. Have any comments or questions about One Lexington? Ask your question and/or share your thoughts about this Building.